Over the weekend, my girlfriend and I took the opportunity to catch a couple of the latest theatrical releases. First up on the schedule was the latest Bond film, Skyfall. Caught up in development hell (primarily caused by a bankruptcy filing two years ago), this film has been four years in the making. Franchise fans can rest at last, knowing that every day of waiting has been worthwhile. Daniel Craig is back as James Bond, his third film as Agent 007. The ever-graceful Dame Judi Dench reprises her role as James’ boss, M, making her seventh appearance in a Bond film (a role she first assumed alongside Pierce Brosnan’s Bond in Goldeneye in 1995). Starring as the antagonist of Skyfall is Javier Bardem. Bardem brings an eerie boyish energy to the role of Raoul Silva, a computer hacker with a dark connection to M.
Skyfall’s release marks the fiftieth anniversary of the film series, and I can’t imagine a more perfect present to mark the occasion. Daniel Craig’s performance is emotional and sincere as the movie’s plot forces Bond to revisit his past and secure MI6’s future in a rapidly changing world. When hacker and cyberterrorist Silva attacks the security agency’s headquarters, James must return to England to protect M, who is now facing queries and pressure from oversight organizations. Can 007 succeed in a world where a man can “do more damage on [his] laptop in [his] pyjamas than [Bond] can do in a year in the field”? Is everything as black and white as it seems? Bond travels around the world, from England to Macau, leaving no beautiful woman unseduced and no martini undrunk, and he does it all with impeccable fashion, but as Silva chases M and Bond chases Silva, there’s no telling who might get caught in the crossfire. 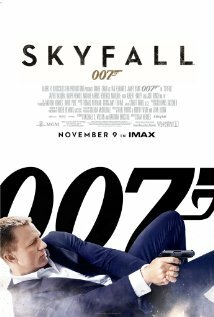 Skyfall had a lot to live up to, given the delay and the hype that always surrounds a new James Bond film, and the script and cast do not disappoint. Neither do the breathtaking visuals, fast car chases, intense action sequences (Craig has always been a more physical Bond, as he proved in his free-running intro back in Casino Royale), and beautiful score (headlined by Adele’s “Skyfall” theme). Ladies and gentlemen, break out the suits and cocktail gowns and dust off your martini glasses. Bond is undeniably back. After braving the cold of a November evening in Colorado to make a trip to the nearby brewery (delicious local stout was had, as was, of course, a martini), we returned to the theatre for the second film of the evening, Wreck-It Ralph. Wreck-It Ralph is the latest animated feature from Disney, and it is a wonderful tribute to video game lovers everywhere. The film is set inside an arcade, where some games come and go, but others, like the (sadly fictional) Fix-It Felix Jr. remain popular decades after their release. Ralph is the villain of Fix-It Felix Jr., and as such, he spends his days climbing to the top of an apartment building (built over his bulldozed forest home) to destroy it, threatening the homes and lives of the Nicelanders until Fix-It Felix Jr. can come to the rescue with his magic hammer. When the arcade closes for the night, however, Ralph and the other video game characters are free to gather in the Game Central Station, a massive terminal where the characters can mingle, have a beer at Tapper’s, or pass through the power cables into other arcade cabinets. On the eve of the 30th anniversary of his game, Ralph leaves a support group (hosted by Clyde) after hearing from other villains, and realizing that he’s not thrilled with the idea of remaining a villain. After crashing a party thrown by the Nicelanders in Felix’s honor, Ralph sets off to a first-person shooter to win a medal, believing that becoming a hero in another game will earn him respect. While initially somewhat successful (Ralph does get a medal), his quest is derailed when he accidentally ends up in the racing game Sugar Rush. The childish Vanellope Von Schweetz steals Ralph’s medal, and working alongside her is the only way for Ralph to get it back. Unfortunately, Ralph’s game-jumping could spell disaster for his own game (what happens when the villain doesn’t show up for work?) and potentially the entire arcade. 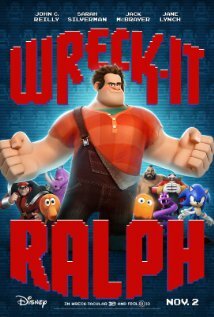 Wreck-It Ralph is a fun ride, filled with great cameos and background events taken from the long history of video games. You’ll find yourself cheering for Ralph from the get-go, and learn that being a bad guy doesn’t necessarily make you a bad guy. The animation is phenomenal, as we get to see the evolution of gaming graphics from 8-bit to high definition (animators apparently had the most trouble making certain characters move jerkily, having trained their whole careers to strive for fluid motions). The voice acting is spot-on, with John C. Reilly as Ralph and Sarah Silverman (in what may be her most sincere and heartwarming role to date) as Vanellope, and the soundtrack includes catchy 8-bit-inspired tracks by Buckner and Garcia (of Pac-Man Fever fame) and Owl City. By the time the credits roll, you’ll be wishing you could put another quarter in the machine and do it all over again.